Reading books doesn’t mean to read the physical book only. We can also read digital books, eBooks etc. As we are living in a world of technology, having a smartphone is common enough. If you are a passionate reader than you can install a lot of amazing apps from the Google Play Store to do the reading. Using such apps, you can access your favorite books and join any community that you love the most. Also, these kinds of app provide many collections of books which are written by various authors. You can find thousands of such apps in play store. 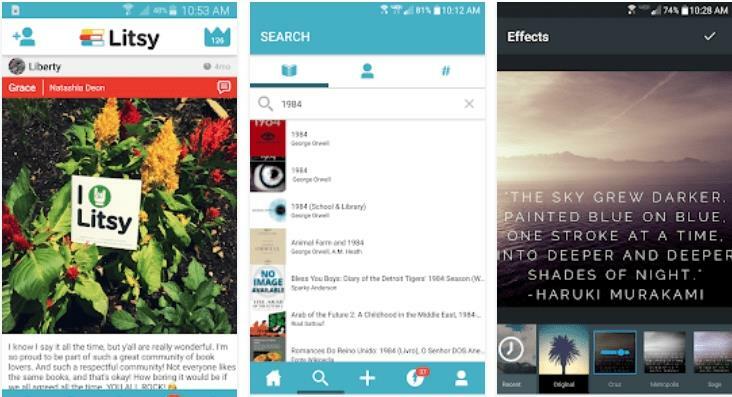 But if you are getting confused in selecting an app, then we have selected the top 5 best Android Apps for Book Lovers. Litsy is the place where you can discover your favorite books and share with your loved ones. It is one of the best community for passionate readers, authors, and influencers which create a short post about their reading moments. The app also has a scoring system which will rate you according to the number of posts you share. However, most of the book lovers are passionate about sharing to the world what they’re currently reading. So Litsy app is the best platform for them, where they can make different kinds of posts but each post is linked to one book. With this app, you can post photos, quotes, and also your reviews. You can download Litsy app directly from Play Store without any cost. Google Play Books is an ebook app developed by Google. 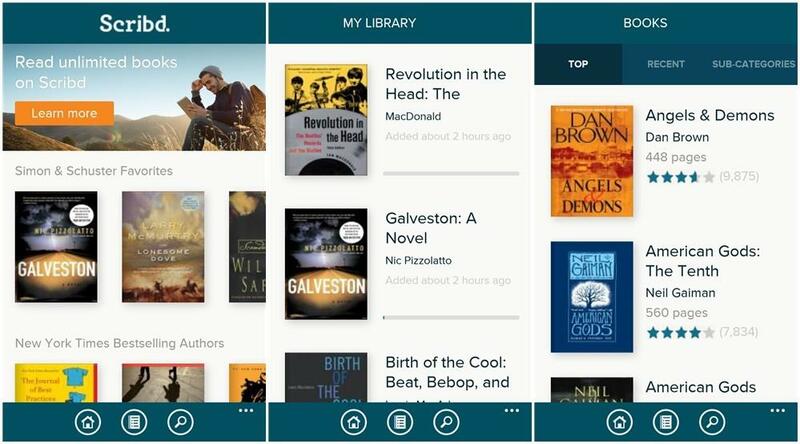 For reading, the app provides you tons of different books in the library. With this app, you can upload your favorite ebook in PDF format, or EPUB format. As it is a Google-based app, so you can access any of book from a library using a browser. Moreover, you can purchase books right from the Play Store or the Google Play web interface. The app has very simple UI where you can add bookmarks to a page or highlight specific paragraphs or sentences. It has three different reading modes which include day, night, and sepia modes. Also, you can manage the font and font-size as per your choice. Goodreads is the best app for readers which gives them a chance to rate all of the books that they have read. You can post your review on any of the books and also check the recommendations from other users. 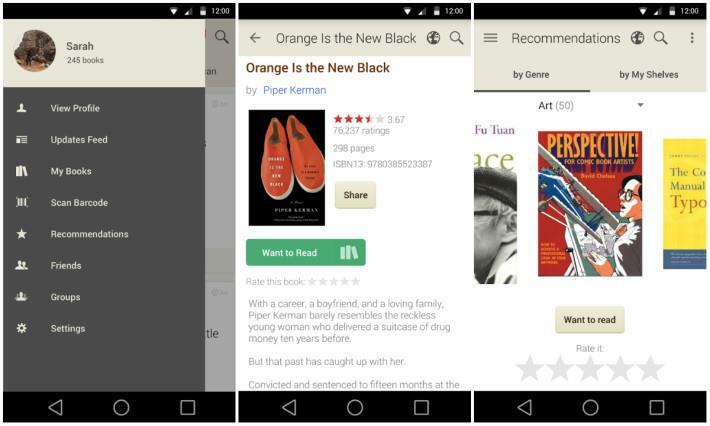 The app provides you genre filters which can be used to find a book from the library. Also, you can make virtual shelves of your favorite book and it can be accessed any time. Moreover, use your smartphone camera to scan a book’s barcode. After scanning it will provide all the information of the book. Goodreads is the best app for passionate readers. With this app, not only you can keep your books well organized, but also share your thoughts and recommendations with thousands of other readers. You can download Goodreads app directly from Play Store. Wattpad is one of the largest community of passionate reader and writers. In this app, you can read thousands of books written by some of the best writers around the world. Wattpad provides you 3 million books and 75 million stories which romance, science fiction and more. You can share the books that have been read on any social networking site and also you can upload the content that you wrote yourself. Moreover, the app also provides an auto-scroll functionality, offline reading, and night mode. With Wattpad app, you can also read a book that is still in progress. It is a better option than waiting for the writer to complete the entire novel. You can read its chapter by chapter, as it is written by a writer. The app is free to use and you can download it directly from Google Play Store. Scribd is one of the oldest and best eBook subscription apps on Play Store. The app includes a monthly membership which later allows you to access an unlimited amount of best books, audiobooks, news, magazines, documents, and more. It also provides 30-day free trial for a new reader. The app has a smart design that makes it easy to explore topics and related content. You can save your offline book and enjoy it later, even without an internet connection. As the app includes a membership that starts at $8.99 which is a plan for a monthly subscription. 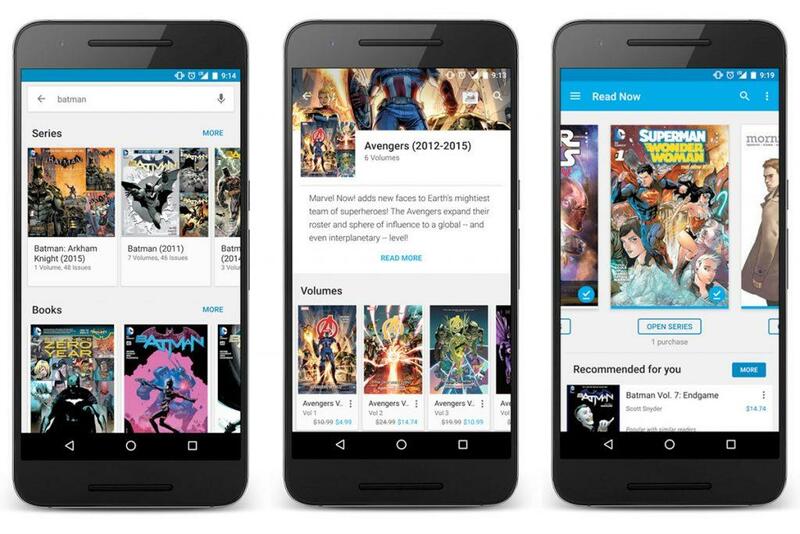 With this app, you get documents, comic books, and audio which makes a better deal for a reader. You can download Scribd directly from Play Store. Also Read: How to Download Scribd Documents and Books for Free. There’s no doubt that reading is to the mind what exercise is to the body. Once you form the habit of reading good and educative books, then you will be free forever. With the above listed apps for book lovers, you’ll be able to improve your literacy and move from misery to hope.